The settings dialog contains several tabs with specific settings under each one. This page describes the Network settings tab. Enabling this option will display a small green bar at the lower right of the Dashboard when it is connected to the Server. The bar shows the quality of your connection. If the bar grows in size, or turns yellow or red then your connection quality is low, and some data may not be received by the Dashboard. If you want to connect to the Codemasters F1 sims, then you should enter the IP address being used by the Codemasters sim here. This is usually 127.0.0.1. 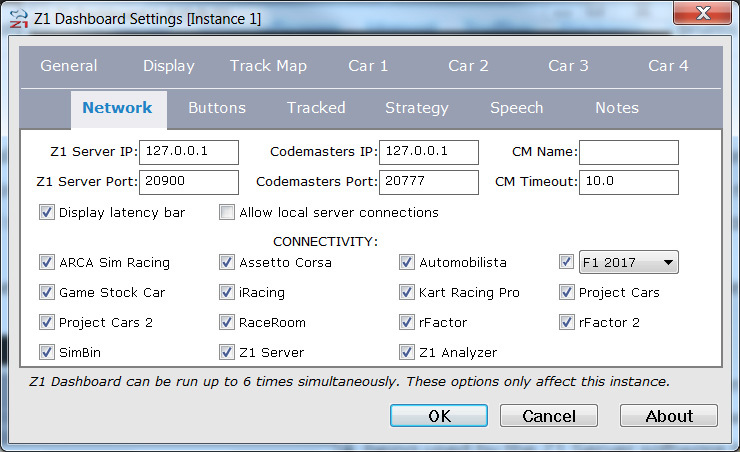 If you want to connect to the Codemasters F1 sims, then you should enter the port being used by the Codemasters sim here. This is usually 20777. Codemasters turns off telemetry when you pause or exit the sim. Since there is no way for the Z1 Dashboard to know if the sim is just paused or has exited, it will wait for the number of seconds specified here for the sim to resume. If it does not resume within that time frame then the Z1 Dashboard will assume the sim has exited.